Our freezer. 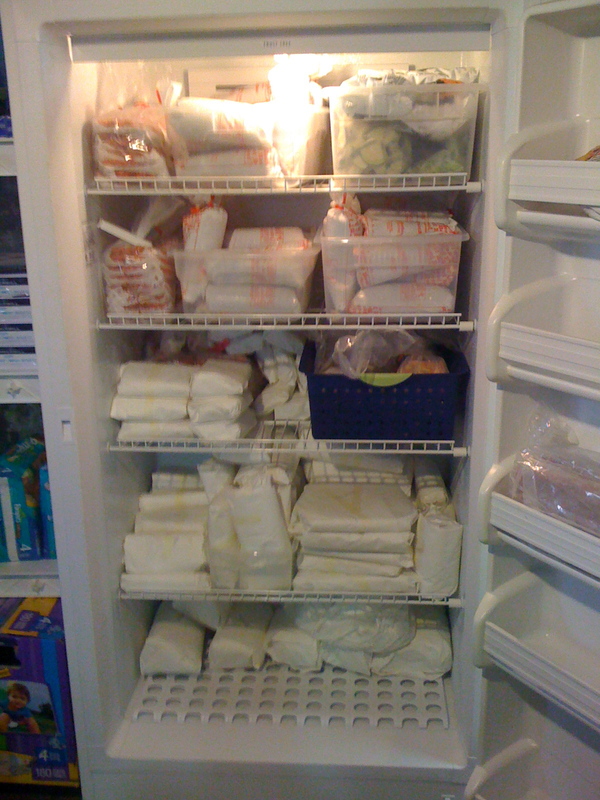 Not what it looks like at the moment, but this is a photo from the annual round of Freezer Tetris when our side of beef arrives in the fall. For me, part of nesting is organizing the pantry & the freezer to make sure that we have enough groceries on hand for the first week or two after the baby is born. Since I won’t feel up to grocery shopping for sometime, I did my last big trip yesterday since my dad is in town, and had one major problem when I got home – no room in the freezer for what we purchased. Luckily, I was able to squeeze everything in there last night so it wouldn’t defrost, but the freezer was in need of some TLC, so this morning, I tackled the chest freezer in the basement as well as the freezer attached to our fridge in the kitchen. Play the TETRIS theme music while organizing. It helps! Place trash items in small plastic bags (shopping bags) to help contain messes as things melt. When bringing all of those little trash bags up from the basement (or out of the kitchen to the curb) rely heavily on child labor. It saves you a lot of time & energy, and young children enjoy helping. When having to wait 4 days until trash day, placing items in a variety of small plastic bags to go into the trash will hopefully prevent flies, stink, and the neighborhood critters (not limited to cats and raccoons) from getting into everything, as will an outdoor trash can with a heavy lid. Place said trash can away from any possible open windows, and do not store in an attached garage where potential stink can waft into the house. One hour later, I can now find stuff in both freezers, and I even have a few open shelves in case I do anymore shopping (I do still have the Entenmann’s Groupon to use before next week, and if you haven’t grabbed it yet, its still available! ).